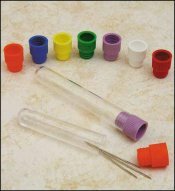 Short Needle Tubes Needle Organizer  - $16.00 : Yarn Tree, Your wholesale source for cross stitch supplies. Item 3149. Short Needle Tubes. Cool little clear polystyrene tubes to store your needles. Assorted cap colors to keep your needles sorted. Short needle tubes are 1 7/8” long inside and fits most tapestry needles. (Long needle tubes are 2 5/8” long inside and will store most other needles). Both have interior diameter of 3/8”. Can also be used as storage for beads or small embellishments. Sold in a bag of 50 tubes with assorted lid colors in each bag. Order by the bag.